Concrete Foundation Crack Repair and Damage Assessment in Foundation Floor, Basement, Garage Floor, Patio, In-ground Pool, Driveway, using innovative and long-lasting technology for over 30 years by locally owned and operated company. 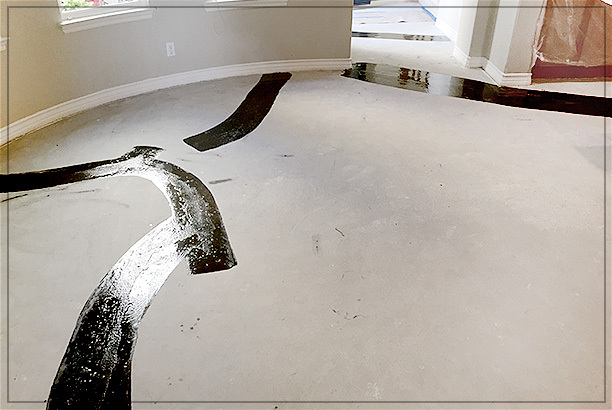 Covalt Floor Leveling is a concrete floor foundation crack repair contractor of residential, commercial, industrial, government and municipal properties. We specialize in identifying and solving concrete floor and slab crack problems related to slab foundation settling, concrete lifting, and soil stabilization problems. A large crack across a concrete beam is serious and means it is time to call a professional to determine whether the damage is structural or superficial with advanced non-destructive evaluation techniques (ground penetrating radar, infrared thermography, impact-echo, electromagnetic induction). These techniques can reveal a lot about the condition of the foundation in your property. We at Covalt Floor Leveling use advanced foundation crack repair techniques needed to permanently repair cracks in concrete or cement, sustain your home’s value, and most importantly maintain your safety. Even though it appears small concrete cracks are common, especially in California (basement, garage floor, patio, foundation floor), we don’t recommend to leave them ignored. These cracks are usually caused by drying shrinkage, thermal movement, or other causes. 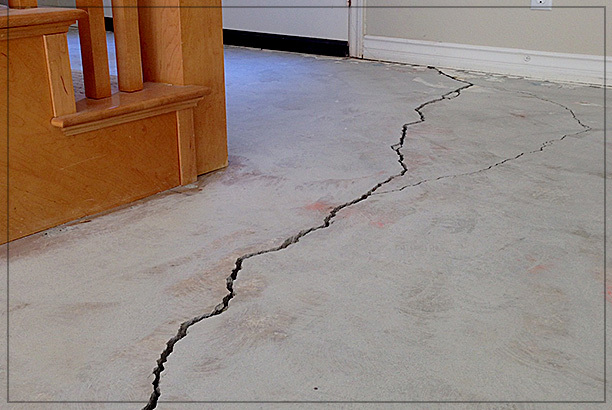 In most cases, these cracks will widen over time and result in water seepage or loss of structural integrity. Foundation and slab cracks are not only a nuisance and an eyesore, but they eventually diminish the value of your property. Don’t Wait! Request a FREE No Obligation Quote Today! 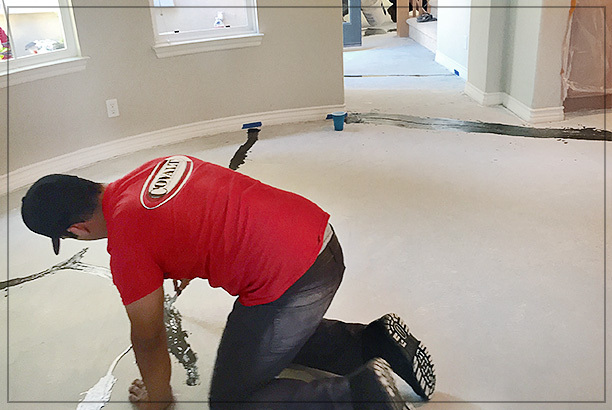 Covalt Floor Leveling has serviced thousands of both residential and commercial customers in Southern California for over 30 years. We strive to provide the highest quality of concrete crack repair service at the best possible price. Symptoms of a Foundation Problem: flooring cracks, wall cracks, brick and mortar separation, window separation (gaps between the window and frame), certain plumbing problems, incorrectly functioning doors (sticking at the top of the frame, not latching, swinging on their own, etc. ), and roofing problems. Epoxy seal compounds for crack restoration are available in a range of thicknesses to accommodate various cracks of different widths (the wider the crack, the thicker the material required). The main advantage of epoxies is their incredible compressive strength, which exceeds most concretes. That’s why we choose epoxies for cracks requiring structural repair. Epoxy seal compounds cure relatively slow (several hours), allowing time for the material to fill even the smallest crevices of the crack before hardening. Don’t let one of the most important investments in your life — your home or business — be destroyed because of foundation problems, regardless if it is the fault of the builder or just the natural shifting of the ground. We at Covalt Floor Leveling use the proven foundation repair techniques needed to preserve your home’s value and most importantly – maintain your safety. 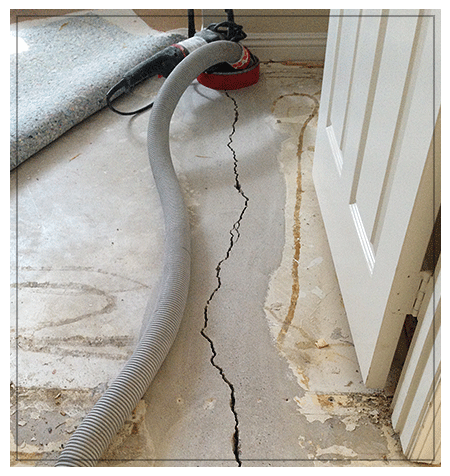 WIDENING THE CRACK CREATES A KEYED SURFACE FOR MORE SECURE AND RELIABLE REPAIR. AN EPOXY SEAL COMPOUND IS APPLIED SKILLFULLY AND WITH PRECISION. SURFACE READY FOR CARPET / WOOD / TILES, ETC. 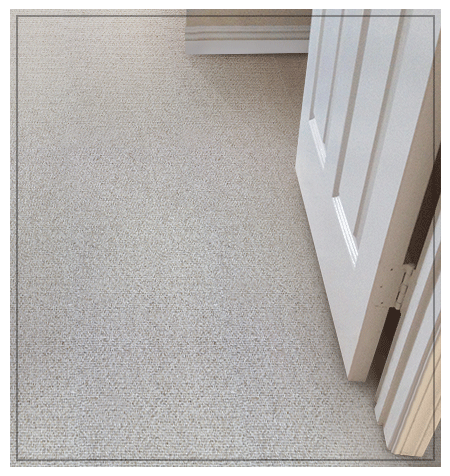 THE CARPET IS RESTRETCHED; THE AREA NO LONGER POSES A THREAT TO THE FOUNDATION, CARPET OR SAFETY. WE CAN PROVIDE A WRITTEN REPORT OF FINDINGS, PROPER INDUSTRY STANDARD REPAIR METHOD, SCOPE OF WORK, AND PARTIES OF POTENTIAL LIABILITY. We can determine whether the damage is structural or superficial with advanced non-destructive testing equipment (ground penetrating radar, infrared thermography, impact-echo, electromagnetic induction). These techniques can reveal a considerable amount about the condition of the foundation in your property. WE CAN PROVIDE A WRITTEN REPORT OF FINDINGS, PROPER INDUSTRY STANDARD REPAIR METHOD, SCOPE OF WORK, AND PARTIES OF POTENTIAL LIABILITY. 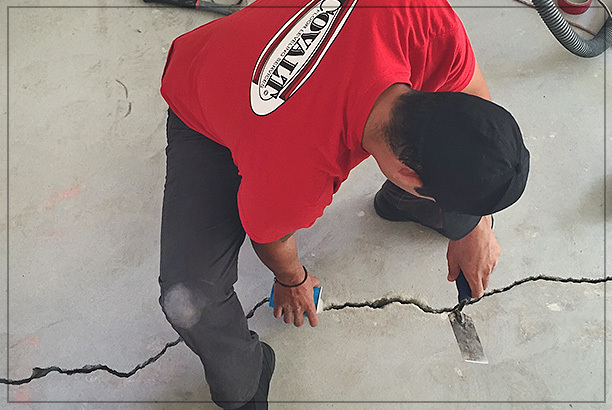 As Southern California’s concrete repair experts, we provide one-step permanent concrete crack floor repair, repair of cracks in cement floor, foundation inspection, and foundation crack repair for both residential and commercial buildings. Whatever caused damage to your foundation: earthquake (lack of earthquake retrofitting), cracking concrete, foundation settlement, unlevel floors, poor compaction, poor drainage system, overloading, poor waterproofing, excessive organic materials, erosion, soil expansion or shrinkage, changes in the moisture content of soil, your foundation crack repair will be started and completed on time by our fully licensed, bonded and insured experts in foundation repair. 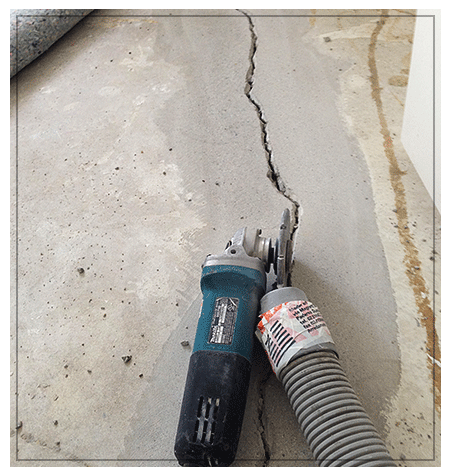 Epoxy Injection Fills and Seals Cracks – Permanently. Our technicians know their craft very well, and we’ll come up with a plan of action to address your cracked foundation issues immediately. 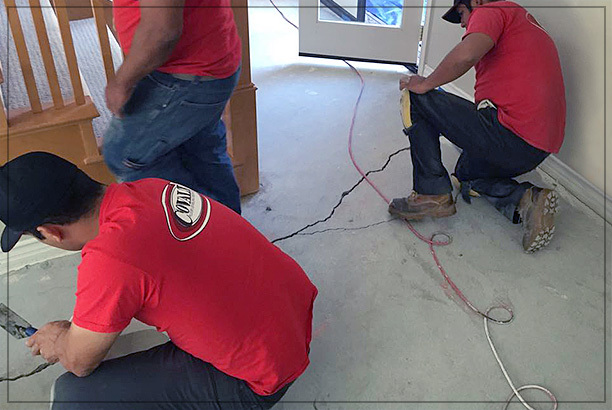 We know the value of attending to even your worst foundation cracks in a quick and safe fashion, and we’ll go above and beyond to provide our services in a timely, cost-effective manner. 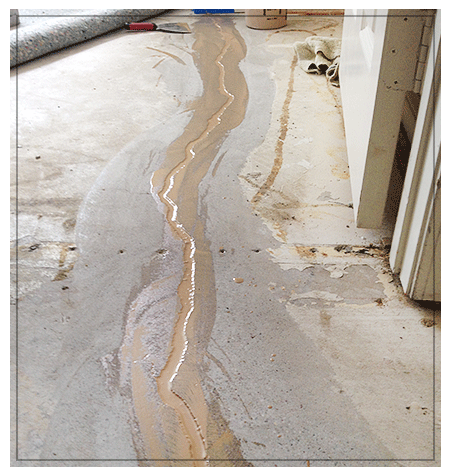 Moisture Guard could be applied to prevent costly flooring failures due to moisture problems. Read More. Contact us today to set up an appointment for a FREE ESTIMATE or Foundation Inspection. Same Day Appointments Available. Warranty available.